I love it when world-class scientists take time from their busy research schedules to engage the general public by opening up their complex theoretical fields to broader understanding. Case in point, one of my all-time favorite physicists, Brian Greene – a theoretical physicist at Columbia University – did exactly this with the publication of his 2008 children’s book, Icarus at the Edge of Time. The 34 page book is a science fiction retelling of the classic Icarus tale - the story told about Icarus and his attempt to escape from Crete by means of wings that his father constructed from feathers and wax. He ignored instructions not to fly too close to the sun, and the melting wax caused him to fall to his death. Listen to Greene describing his story here. 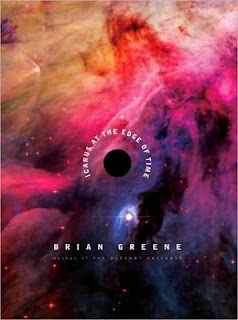 Greene’s Icarus re-imagines the story of Icarus in a world of astrophysics. Instead of donning wax wings and flying into the Sun, a boy build his own spaceship and, against his father’s warning, flies close to a black hole. Black holes have a reputation for reaching out and sucking things in, but they’re not like vacuum cleaners – if you stay outside the black hole’s boundary, or event horizon, you can pull away. The boy does just that, but as Albert Einstein taught us, black holes affect one’s passage through time. When Icarus returns, it is 10,000 years later, which felt like an hour to him, and everything he knew was gone. His father is gone. Icarus at the Edge of Time is a somewhat dark tale for youngsters that teaches a couple of important lessons: Einstein and relativity must not be ignored, and if your Pop tells you to stay away from black holes, you better listen! Last year, Greene took yet another step forward in bringing black hole physics to the masses by having American composer Philip Glass adapt the story to a 45 minute orchestral piece. Greene explained the physics of warped space and time, and Glass struggled to represent it musically. For instance, as the boy got near the black hole, would you want two lines of music playing against each other, one for his timeframe and one for the rest of the Universe? Should you represent gravitational redshift with change in frequency? Glass ended up capturing some of the physics in an artful and poetic way. Opening at the NYU Skirball Center on June 6, 2010, the event attracted many adorably inquisitive kids. Check out the trailer here. So if you want your kids to grow up smart and well-behaved, perhaps you should pick up this book and mix in some black hole physics with that Mozart! Hi Danl, I like Greene too, and Elegant Univ. is so great to learn about b. holes. Thank U for this new info. I have a child who'd love this book.